Just in time for Thanksgiving! Want to go all out for Thanksgiving main course, but take it easy with the sides? you can use your frozen or canned foods that you got from your farmers market! Did you can or freeze those green beans? Everyone will love slow cooker green bean casserole. Did you stock up on jam this summer? You may want a tasty breakfast or dessert with sweet orange marmalade cinnamon rolls! 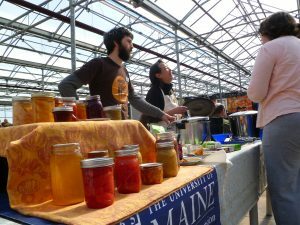 Preserving foods from a farmers market is easier than most people think. It all depends on how acidic the food is on whether you need a pressure canner or not. Usually with most fruits, jams, and vinegar pickles (higher in acidity) can be canned by a boiling water bath! With most pickles you can ferment them naturally and they don’t need to be canned. This is called lacto-fermenting. Typically you’d want to use a pressure canner for more alkaline or lower acidity foods including all plain vegetables (in water) and all meats. We use a pressure canner (very high heat that kills the bad stuff) or vinegar to preserve because botulism can’t survive in an acidic or too high of temperature environment. Check out more information on canning and preserving here from our website. Now that it is the biggest food holiday of the year, you can use up a lot of your preserved foods for some delicious recipes everyone will love. Without further ado, here are 10 recipes, 5 from frozen foods, and 5 from canned foods. Many of the food items can be interchanged for either canned or frozen! Enjoy!